Henri “Papillon” Charrière (Charlie Hunnam) is a safe-cracker in Paris. After stealing some jewels from a local gangster, Papi – Henri’s nickname due to his butterfly tattoo – is framed for murder and sentenced to life in a penal colony in French Guiana known as Devil’s Island. Traveling across the ocean on a prisoner ship, Papi learns just how violent his fellow convicts are. Papi meets Louis Dega (Rami Malek), a currency forger, who fears for his life. Papi agrees to protect Dega from the other inmates and, in exchange, Dega agrees to finance Papi’s escape from prison. When they reach Devil’s Island, the inmates are introduced to Warden Barrot (Yorick van Wageningen), the ruthless head of the prison. Barrot explains the rules to the inmates – the first escape attempt, should you survive, will get you 2 years in solitary; the second attempt earns 5 years; if you commit murder, you will be publicly executed in the prison’s guillotine. During their days of hard labor, Papi and Dega immediately begin planning their escape. Teaming up with Celier (Roland Møller) and Maturett (Joel Basman), two other prisoners, the group sets their plan in motion. Based on the memoirs of Henri Charrière, Papillon tells the true story of a draconian prison system run by a warden and guards whose powers have no checks in place. 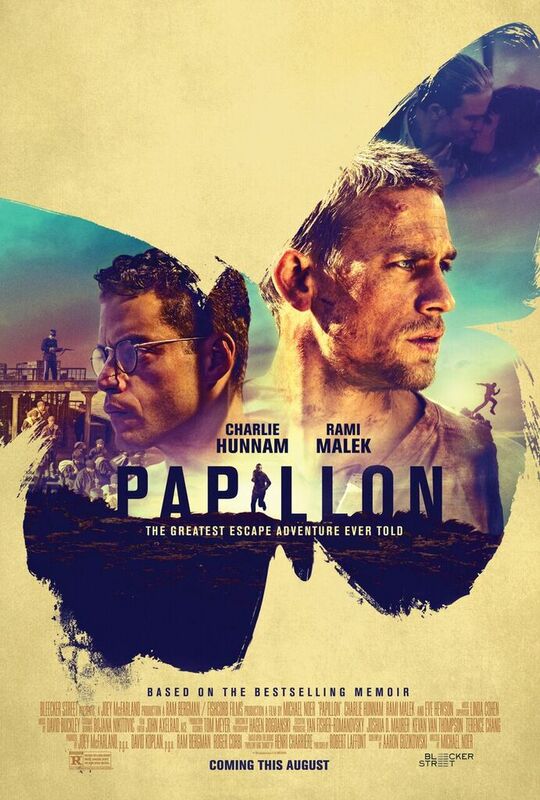 Starring as the titular Papillon, Charlie Hunnam does an excellent job in the film. Motivated only by the hope of returning home, Papi finds the will to survive anything thrown at him. Hunnam portrays this perseverance and sheer determination in every aspect. He committed to the role physically as well, starting off with a chiseled physique which then withers away to almost nothing. Hunnam lost nearly 40 pounds during the course of filming. Rami Malek fills the part of the meek forger almost perfectly. His smaller stature and timidness in the role accentuates why he is desperate for protection. While I can’t complain about the acting, I only wish he didn’t mumble quite so much, making it difficult to determine what he was saying at times. Aside from Yorick van Wageningen’s warden, Roland Møller and Joel Basman, who perform well, the rest of the cast are primarily prisoners and guards who could have been played by anyone, though those in the roles are adequate. It’s difficult to watch Papillon without seeing echoes of The Shawshank Redemption throughout the film. Both Charrière and Shawshank‘s Andy Dufresne are framed for murder and sentenced to life in prison. Those prisons are run by heartless wardens and guards who regularly abuse inmates. The escapes in both films are carried out during a storm. While Shawshank is an excellent film, what sets Papillon apart is that it is based on a real inmate in a real prison. The conditions Charrière had to endure are almost unimaginable. Telling the harrowing tale of a falsely imprisoned inmate looking to go home, Papillon explores the almost incredible extent to which people will go, given hope. It is an impelling story that you almost have to see to believe. The fact that it is based on a true story just makes it even more unthinkable. Solid performances and cinematography elevate the movie. Catch it in the theater if you can. If not, rent it when you can.